Whole grains are a weight-loss secret weapon. People who eat the greatest number of servings of minimally processed whole-grain foods—not snack foods, like crackers, cookies, and chips—enjoy the biggest weight-control benefits, research shows. Whole grains rich in insoluble fiber help you feel full longer, so you won’t give in to unhealthy temptations. They also help stabilize your blood sugar. Your body starts to store fat when your insulin levels rise. Whole grains help burn fat by slowly releasing their energy so insulin levels don’t spike. Grains are a source of carbohydrates, which are important to your health. However, the wrong type of carbohydrate can be detrimental to your weight, blood sugar, and dieting efforts. Replace refined carbs like white rice and white bread with whole grains like oats, quinoa and brown rice, and you can decrease your belly fat over time. Your body burns twice as many calories breaking down whole foods (especially those rich in fiber such as oatmeal and brown rice) than processed foods. 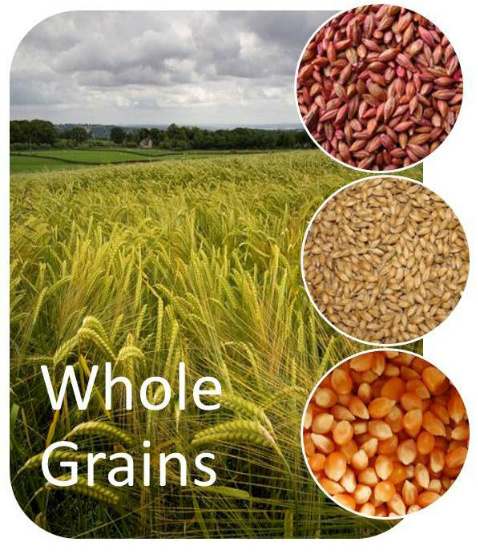 Whole grain kernels consist of three parts: the bran, the endosperm and the germ. Each part offers a wide variety of health benefits along with nutrients. The bran is the outermost layer that contains fiber, antioxidants, B vitamins and phytochemicals. Next comes the endosperm, which is the middle layer that contains mostly carbohydrates, some protein and small amounts of B vitamins and minerals. Finally, the innermost layer contains the germ, which houses all the healthy fats, B vitamins, phytochemicals and antioxidants. In most refined grain options, the germ and bran (and all of their wonderful components) get stripped away, leaving behind the starch-heavy and nutrient-deficient endosperm. To get the most out of your grains, choose ones that keep all three parts intact. When thinking about what grains are good for weight loss, focus on whole grains that retain their nutritional value and are good for weight loss. As with any food, be sure to include grains in your overall healthy diet and do not try to lose weight by just eating grains. Oats are good for your body in many ways. They help stabilize blood sugar and lower cholesterol. Stable blood sugar may help your energy level and reduce your cravings for sugary foods. Oats are high in protein and fiber so a serving can help you feel full throughout the day. Just a half cup packs 4.6 grams of Resistant Starch, a healthy carb that boosts metabolism and burns fat. People who include oats in their diet tend to weigh less and eat fewer calories than people who avoid oats. Oats are available in many forms including instant, steel-cut, rolled, bran, groats, flakes, and flour. The best options are the less refined ones like steel-cut, rolled, flakes, and bran. Choose steel cut oats over rolled oats because steel cut oats are the whole oat grain. It takes longer to cook but it’s has more nutrients. A large batch of steel cut oats can be cooked at one time and frozen in single serving portions. This makes eating a healthy breakfast possible on busy mornings. Oat flour is an excellent substitute for wheat flour in baking recipes. A good source of minerals like manganese, selenium, magnesium, and the sleep aid tryptophan, in many studies oats also assist with lowering cholesterol and reducing the risk of heart disease. Many people who are gluten-free can eat oats while losing weight without experiencing adverse problems, but always check with your doctor. Quinoa (pronounced keen-wa) is a nutritional powerhouse that belongs in your weight loss plan. This ancient nutritional all-star grain is known as a complete whole grain, combining 8 grams of hunger-busting protein, 5 grams of fiber in one cup, B vitamins and complex carbohydrates all in one. It's also packed with nutrients such as iron, zinc, selenium, and vitamin E. Quinoa's claim to fame is that unlike other grains, it's a complete protein. That means you don't have to pair it with another protein source like meat or dairy. Plus it’s quick, too, cooking up in about half the time it takes to make rice. You'll stay full longer on fewer calories and avoid overeating at other meals. If you are craving carbs during your lunch or dinner hours or eats instead of cereal for breakfast you can always go in for quinoa. Said to be an alternative for rice, it's rich in proteins and fiber and is a wonderful food that aids in weight loss. Ragi / Finger millet is good for weight loss because of its high fiber and protein content. Finger millet can be helpful in decreasing the constant desire to eat, thus, reducing the daily calorie intake. It has a low glycemic index and can help to suppress appetite. Finger millet is an ideal food for the obese, because its digestion is slow and due to this, the carbohydrates take a longer time to get absorbed. Finger millet contains an abundant quantity of calcium, phosphorous, iron, vitamin B1, B2 & prevents malnutrition. Finger millets need to be included in your daily diet plan. Native to Ethiopia, this gluten-free grain is tiny in size, (so small that it can’t be processed or refined) which allows it to be cooked quickly and it is becoming more popular because it’s so versatile. It's considered the leading grain in calcium content, providing 123 milligrams per cup, which is equivalent to a half cup of cooked spinach. Strangely enough, teff is also a great source of vitamin C, which is not normally found in grains. This super grain is also high in resistant starch, which makes it great for managing blood sugar levels and weight control and also aids in colon health. Teff may help to suppress hunger, preventing you from overeating. Foods that suppress hunger are believed to be able to promote weight loss. Teff is high in a resistant starch, which is a type of fiber that helps to balance blood sugar and manage diabetes. This benefit makes teff an ideal grain for weight loss, as high blood sugar levels will trigger your body to store fat. Stabilized blood sugar will help keep energy levels sustained and prevent sugar cravings. Brown rice is more nutritious and a much better option than white rice. Unlike white rice it offers you vitamin E (important for healthy immunity, skin, and many essential functions in your body) and also contains a rich supply of energizing B vitamins, which could help you burn calories faster. Brown rice is a heartier, fiber-packed alternative to less-than-super white rice. A half-cup serving contains 1.7 grams of Resistant Starch, a healthy carb that boosts metabolism and burns fat. Plus, brown rice is a low-energy-density food, meaning it's heavy and filling but low in calories. White rice is stripped off its fiber and most nutrients too. In its whole brown rice form, it contains high amounts of the minerals manganese, magnesium, and selenium. It also contains tryptophan, which helps with sleep. Brown rice can easily replace white rice in almost any recipe: soups, stews, and pilafs. It is an excellent choice for those who are gluten-sensitive or celiac. Barley is probably one of the most familiar grains that you know of, and for good reason: It contains the highest fiber content of all whole grains. Barley is a great addition to a healthy diet. Because barley contains plentiful amounts of both soluble and insoluble fiber, it helps aid bowel regularity. This starchy side makes a slimming complement to a low-cal meal by adding some satisfying fiber and nearly 2 grams of Resistant Starch in just a half-cup serving. Barley is low on the glycemic index, meaning it helps stabilize your blood sugar. Stable blood sugar may help your energy level and reduce your cravings for sugary foods. In addition, it’s loaded with antioxidants, vitamins and minerals that are essential for a healthy life. Scientific evidence has demonstrated that barley may play a role in the reduction of several diseases by lowering blood pressure and LDL (or “lousy”) cholesterol levels and by helping with insulin sensitivity. This versatile ingredient can be added to soups, stews, cereal, salads, pilaf, or ground into flour for baked goods or desserts. Enjoy a delicious barley side dish instead of white rice with dinner and you could be well on your way to shedding dangerous belly fat, according to a study in the American Journal of Clinical Nutrition. Vegetable seeds that grow in pods, such as peas and lentils, are classified as legumes. Legumes, such as lentils, are full of fiber, low in fat and provide a minimal amount of calories per serving. A half-cup serving delivers 3.4 grams of Resistant Starch, a healthy carb that boosts metabolism and burns fat. Lentils are a beneficial part of a weight-loss diet, since the high fiber content of lentils can improve satiety and help keep you feeling full for hours. Lentils are high in protein and other essential nutrients, including folate, iron, potassium and many various antioxidants – each lending a special nutritional value. Lentils have more fiber than one serving of bran flakes; gram-for-gram, lentils have more protein than beef. The soluble fiber also lowers blood cholesterol as it gives you that full feeling you need to avoid temptation and help with weight loss. Horse Gram is a lentil commonly used in Asian cooking especially Indian cooking. It has excellent fat burning properties and helps to shed your pounds rapidly. It is an excellent food to reduce bad cholesterol like the popular flax seed. Horse gram best for tackling obesity as it actually works by tackling the fatty tissue. It helps to break down such tissue and forces the body to use fats in the best possible manner. The horse gram also positively influences the cholesterol levels. It helps to regularize the cholesterol and sugar levels in our blood stream – both of which really impact our eating behaviors. This is also one of the reasons for the declaration that horse gram and weight loss can go hand in hand. Also, horse gram can trigger a certain level of satiety for some time after a meal. There are so many other ways in which the horse gram can be consumed. Horse gram soup or Sprouted Horse gram soup is another way of consuming it. Alternatively, you can use them as sprouts or as powder. You might not have realized that cheap, filling, and versatile, beans actually count as vegetables. Beans are a welcome addition to weight-loss meal plans because they are packed with essential nutrients and help keep you feeling full for long periods of time. The great thing about using them for weight loss is that they also count as a source of protein and have lots of fiber. Each tiny bean is packed with nutrients, including protein and fiber, while remaining low in calories and full of slow-release energy. This means you’ll feel fuller, which may stop you from eating more, while the high protein content will help firm up your muscles and keep you toned. This super food contains resistant starch, an ab-fat fighter that's also found in potatoes, bananas, and corn. Resistant starch does not turn to sugar like most other carbs; instead, it passes through the body undigested, acting like a fiber. So cut down on your meat intake and substitute all or some of it with beans instead. Swap out burgers for burritos, and beef chilli for bean chilli or add chickpeas or kidney beans to your salad. !). If you're buying canned beans, look for low-sodium versions, and rinse them well before using. One of several varieties of beans to make the list, red beans offers protein and fiber (more than 5 grams per serving!). Red kidney beans are also a good source of folate, magnesium, phosphorus, manganese, iron, copper and potassium. kidney beans help keep blood pressure in check, while their high fiber content helps reduce bad LDL cholesterol, fighting off heart disease. Kidney beans are also rich in Resistant Starch; a 1/2-cup serving packs nearly 2 grams of this slimming carb. Eating beans, including kidney beans, more often may help reduce your risk for heart disease, cancer and diabetes, and may also help you lose weight. This may be due to the fiber and protein they contain. Considered a "super food," white beans (also called navy beans) are a nutrient-packed dietary staple for weight loss. Their versatility makes them ideal for dieters who want to lose weight while still enjoying a variety of tastes. The more excited you are about them, the more inclined you are to eat them for weight loss. They are low in calories, high in fiber, and the best part is that they release fiber slowly into your bloodstream--making you feel fuller longer. One-half cup of these fiber-packed beans contains almost 4 grams of fat-blasting Resistant Starch, a healthy carb that boosts metabolism. When you incorporate white beans into your daily diet, you'll be well on your way to permanent weight loss. Garbanzo beans, also known as chick peas, are a favorite food for many people. Garbanzo beans are naturally low in fat, high in protein and rich in fiber, which makes them ideal for a weight-loss diet. Garbanzo beans promote weight loss by helping to feel full without being full of fat and calories. They will help curb your appetite and hunger, leaving you with a full feeling as if you had eaten something much heavier and higher in calories. Salad with chickpeas is tasty and can keep you full longer, controlling the appetite. These slimming beans pack more than 2 grams of Resistant Starch per half-cup serving. Additionally, the dietary fiber in garbanzo beans helps to decrease the amount of glucose that is absorbed into your bloodstream, which keeps your blood sugar low and discourages your body from storing fat. Black beans are high in the powerful phytochemical anthocyanins — the same ones found in blueberries. Studies indicate the darker the bean, the higher it may be in antioxidants. A cup of black beans packs a whopping 15 grams of satisfying protein and doesn't contain any of the saturated fat found in other protein sources, like red meat. Black beans even have a small amount of omega-3 fatty acids, which boost heart health. White Kidney Beans help you lose weight as they provide fiber and are low in fat. White Kidney Beans also have a lot of protein and recent research indicates that white kidney beans, (Phaseolus vulgaris) contain a compound that acts as amylase blocker to inhibit the digestion of carbohydrates. The body readily stores carbs as unwanted fat all over the body (excess carbohydrates can cause damage to your metabolic state and hinder weight loss efforts). Since white beans contain large amounts of dietary fiber they also slow the digestion of high-glycemic carbohydrates found in breads, pasta and sugars to promote weight loss, Research has shown that white beans may also provide a dramatic reduction in fat accumulation without the loss of muscle mass. Another benefit of these great beans is that they act as an appetite suppressant and can help you feel fuller, longer. Studies have shown that due to the content of a hormone called cholecystokinin (CCK), white beans offer a sensation of satiety after meals and can help reduce the urge to continue eating. Soybeans are a super fat fighter. Soybeans help thwart the accumulation of fats and change fats into energy. For fighting fat, you just can't beat soybeans for their versatility. Though surprisingly high in fat for a bean, it's mostly the healthy unsaturated kind. By lowering your blood level of LDL cholesterol (the "bad" cholesterol), soybeans' unsaturated fat is thought to reduce the risk of heart disease. Soybeans also happen to be one of the few plant sources of omega-3 fatty acids, which may aid in the battle against heart disease and cancer as well as arthritis. Black soybeans are weight-loss superstars because they burn fat and curb appetite. There are many health benefits of black soybeans, which block fat, build muscle, and control hunger. They also increase good cholesterol, decrease bad cholesterol, and fight inflammation. Black soybeans are powerful weight-loss tools because they're low-carb, high-protein and high in fiber. Therefore, they take a long time to digest, so you feel fuller longer, and end up eating less. Consuming a half-cup cup of black soybeans half an hour before a meal will significantly curb your appetite. A half-cup of black soybeans has 120 calories, 8 grams of carbs, 7 grams of fiber, and 11 grams of protein. The antioxidant-rich legumes also help fight heart disease, as they contain the omega-3 fatty acid alpha-linolenic acid.